Watching the build. | House by the water. It has occurred to me that I’m going to have a bit of trouble keeping an eye on the build. Despite the geographical challenge, you’ve probably noticed that I’m doing my best to enjoy every minute of the building process. I’ve let my fingers do the walking and there is not too much that can’t be done online. I realised this morning, that most of the big decisions are just about made and in a few months, it will be time for me to chill out and let the builders do their thing. 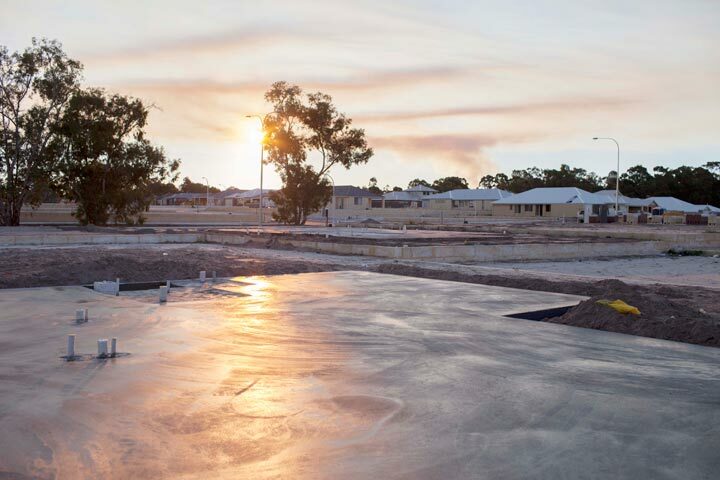 But I know that most people who build visit their developing home at least once a week to check on progress and take a few exciting photos of flat paddocks of sand, slabs, piles of bricks, wiring, scaffolding and that sort of thing. “Sunset over slab” by Brilliana von Katterfeld at Film and Fancy. Install web cams. I couldn’t find a precedent for this. I suspect it would a) p… off the tradespeople and b) be way too complicated for someone who thinks Smart Wiring is a shoe-phone belonging to Agent 86. Approach Mandurah Cruises to see if they will reroute their daily cruise past our block and ask their tourists to email me iPhone pictures. Convince the very lovely, smart, wise and, not to mention, handsome (or should that be beautiful?) builder’s liaison officer to send me weekly progress pictures. Bribe local neighbours, friends and readers to regularly paddle/drive/ride/walk/ motor past our block and send me photos. I’m thinking of a roster system. Payment by the universally accepted currency, beer. Actually, I already owe one homemade apple pie and one home cooked meal for similar favours. I might have to start a new page to keep track of I.O.U.s. No, I’ve got it – payment in wine on the HBTW deck once it’s done. Any takers? 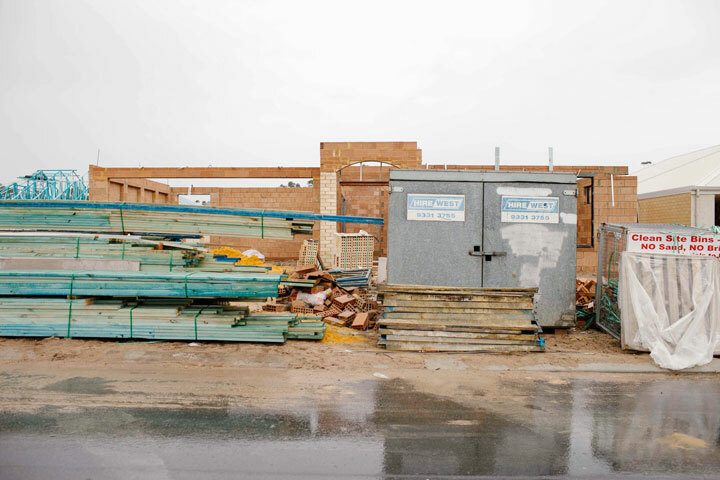 I’ll leave you with a beautiful house building photo, thanks to Brilliana von Katterfeld at Film and Fancy. Don’t you love the colour palette? Teal tinged trusses, sandy bricks, Scandinavian-inspired grey minimalist shed, bitumen in metallic platinum gloss. Will grab some photos now and again for you when we walk or ride past, no worries. We know the feeling. We did the same, from block to finish – hundreds of photos. More so for you being so far away. It will be a superb house for sure. Thank you May. I knew I could rely on Mandurah friends! A few more months before any action I think. I only get down to Mandurah once every 3 or 4 months, so I can take some for you when I’m down that way. Do you know when your build is starting? Thank you Trixee, that’s very kind. Probably a few months off site works. Don’t want to peak to early! I think my Mandurah friends have taken my blatant hints, so don’t worry. You should visit once it is all eventually finished though. I think that any one still listening to me blab on about the build once we are finished will more than deserve a glass of wine on our deck. Ha, ha! I wonder what it will be worth in 30 years… Thank you, but I only promise wine. Or name your home-cooked weakness. 🙂 No worries Johanne, happy to take some photos for you if you’d like us to although we are partial to a feed of local crab. Oh I wish I was close to it. I would be there, taking photos and undertaking any directions you wanted. How often does google earth update? Can you sweet talk them? I think you are going to have lots , lots of takers for taking photos of the work in progress. “Scary’ for the builders… Worst than if you were next door! Well it sounds like you have plenty of people willing to keep you up to date on the progress! It’ll be all the more exciting when you get to see your new home for the first time yourself. I’m in, will trade photos for wine!! I’m overwhelmed by the response (also embarrassed) – might have to put in the underground cellar after all. I LOVE Brilliana von Katterfield’s photos! She makes everything look like art. I totally understand how this would be frustrating but I think you are doing the most amazing job! Pingback: Building inspections. | House by the water.